During the Puppet show, our younger guests are given a sock puppet to use during the show, and then take home as a souvenir. We are in need of service projects to produce these sock puppets. 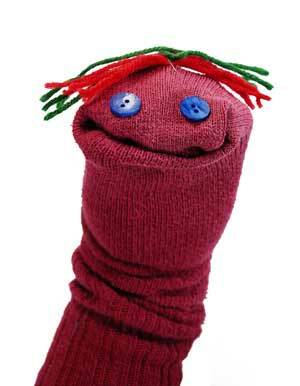 You could collect used socks (Clean, no holes, stains or anything that looks dirty) that could be used for sock puppets. Making these puppetts is also a great Eagle Scout, youth project, family activity, or a community group activity. The puppets definitely do not need to look alike! Variations are encouraged but please keep them simple like this. We need a hundred or more of these per night x 20 nights per season, so thousands are needed each pageant season!